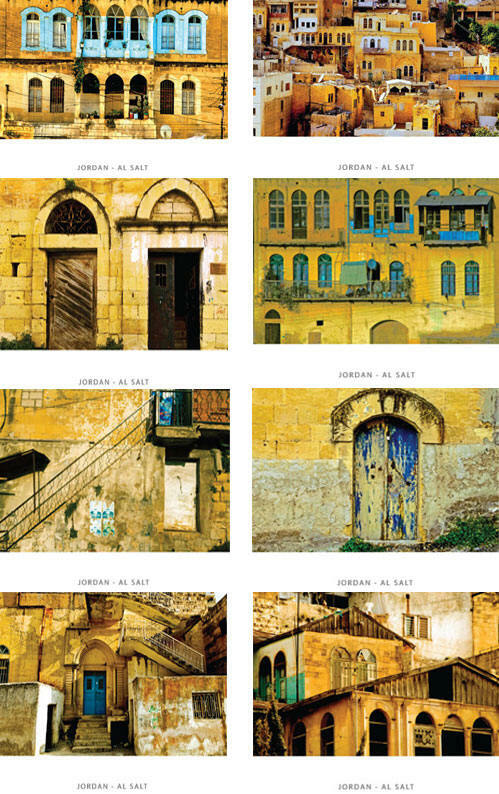 Foresight Art Gallery is pleased to announce the launch of post cards and greeting cards collections which carry photographs of Al Salt City, on the occasion of its nomination as the "City of Jordanian Culture for the year 2008". These collections are printed on fancy card-board paper where each image has an embossed frame; it's an opportunity to greet/congratulate your relatives, friends and colleagues in an artistic and unique way, as Al Salt is a historic Jordanian city with ancient buildings that go back to the Ottoman era in the 19th century and beginning of the 20th century. In addition to buildings that combine between Arab and European architecture, dating back to the first half of last century. These greeting cards enable you to write your own greeting or to order the card with the phrase or sentence of your choice in advance, such as the recipients or sender's name or company name. Each set of cards is either 12 or 24, including envelopes. They are packed in a box and wrapped with a plastic cover. Each greeting card is 15x21 cm, made up of two sides folded in the middle, where each face is made up of two parts; the first part of the first face is centered by a 6x9 cm image of Salt with a hollow embossed black or white frame. On the other side, those greeting cards contain a short introduction on Al Salt City in Arabic and English, with a phrase that refers to Al Salt as "the city of Jordanian Culture for the year 2008", along with the name of the area and site of the photograph on the card. As for including your logo or a certain phrase to the card from the inside, we have to be notified in advance with the number of cards desired to provide you with an offer with the price list. Al Salt cards collection is just the beginning of a series of other Jordanian areas and cities, in addition to paintings by Jordanian and Arab artists, as well as other photography cards that include artistic images of various themes. Please find attached a list of prices according to each collection; you can also view the post cards and greeting cards on our website and order any of them by contacting Ms. Reem Hourani on the numbers or email below.